The MD 550 was designed to meet the requirements of a 1954 specification calling for a small all-weather interceptor fighter capable of attaining an altitude of 18,000m within six minutes and sustaining a speed in excess of M=1.0 in level flight. 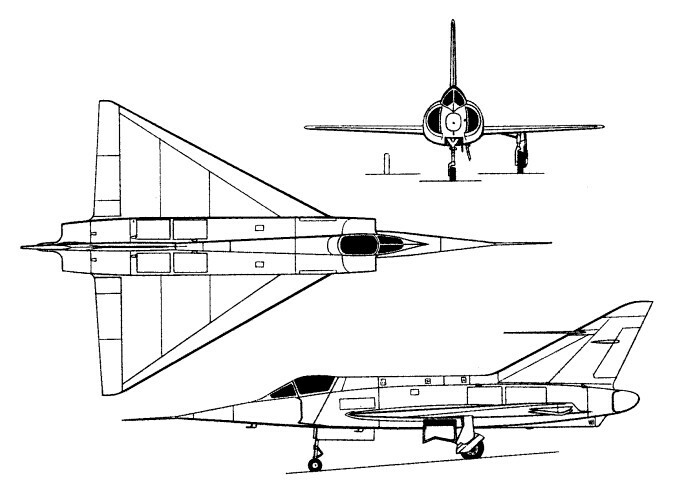 Initially known as the Mystere-Delta, it was competing with the SE.212 Durandal and the SO.9000 Trident. To attend the Armée de L’Air requirements, the Marcel Dassault company presented the project MD.550, a delta wing configuration, with a 5% chord (ratio of airfoil thickness to length) and 60 degree sweep. A tailless delta layout, the MD 550 was powered by two MD 30R (Armstrong Siddeley) Viper turbojets each rated at 980kg with afterburning, and first flew on 25 June 1955. With the original delta vertical tail replaced by swept back surfaces and a 1500kg thrust SEPR 66 bi-fuel auxiliary rocket motor installed, the MD 550 was renamed Mirage I, and, on 17 December 1956, attained M=1.3 in level flight without rocket power and M=1.6 with the rocket lit. Intended armament was a single Matra or Nord AAM carried externally. However, it was concluded that the Mirage I was too small to carry an effective military load, and a slightly enlarged version, the Mirage II with a pair of Turbomeca Gabizo turbojets, was proposed. This proposal was eventually discarded in favour of the Mirage III.